This was when I became irritated. Not because I sat waiting for nearly an hour, or because she poked and prodded and stabbed my teeth with those pointy little pointy tools, but because she could not see that there might be reasons to read that aren't a) assigned reading or b) pure entertainment, and challenged my decision to read beyond either a) or b). Yes, reading Joyce is a different proposition than reading, say, Patterson or Harry Potter or the most recent celebrity memoir. * There's a joy in that difference, though, if we're willing to look for it. I read** Dubliners because I wanted that difference. I was actively seeking it out. I wanted to push my brain to think about the words I am reading in new and challenging ways. This is the heart of Francine Prose's Reading Like a Writer, the book Stephanie chose to center a local "Readers Workshop" book club group last year. The premise of the book club was simple, but unendingly complex: we'd read a chapter of Prose each month (Words, Sentences, Dialogue, etc.) and then a book that exemplified that chapter. Along the way, we relearned how to read slowly, to read closely, to read with a student's eye. 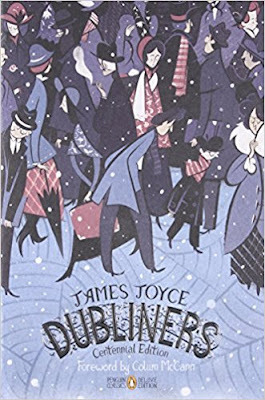 The official Readers Workshop ended last year, but Stephanie and I have rebooted it as a cross-country conversation between friends for 2018, and Dubliners was the first book in our list. It aligned with Prose's chapter on "Words," and let me tell you: reading Joyce with an eye for word choice, alignment, and sound is something. It's a hard something (though not as hard as Ulysses), but it's a worth-it something. There's a reason, after all, that these kinds of books are assigned in school--and it's not just because someone said they had to be. It's because they have something to offer us, be it embedded within their plot, their social commentary, their writing style, or, most commonly, some combination therein. To answer the dentist's question, which I deflected at the time by opening my mouth for the first of many pointy instruments: There are plenty of reasons to read Joyce, even if it's not for school. We read Joyce to learn that not everything Joyce wrote is as intimidating as we've let it become in our imaginations. We read Joyce to appreciate his words. We read Joyce to appreciate his thinking. We read Joyce to understand a Dublin of long ago, which has shaped the Dublin of today. We read Joyce to keep in touch with far-away friends who share a love of literature and learning. They're all good reasons on their own, but combined? That's something else entirely, something it would have taken me far longer than my "lost" 45 minutes to explain to a close-minded dentist. * I have absolutely nothing against Patterson or Harry Potter or celebrity memoirs. In fact, I quite like all of the above. But we do not read Patterson or Harry Potter or celebrity memoirs for the same reasons we may read James Joyce. Don't @ me. ** Technically this was a re-read, because I did read Dubliners in school the first time. I liked it more than I thought I would the first time around, and even more than that the second time around. If you do decide to read Dubliners (really, I do recommend it; it's not stream of consciousness or scary or confusing like Joyce is known to be), I highly recommend the Penguin Classics edition, with notes by Terence Brown. Skip the introduction--it's long-winded and not particularly interesting--but make an effort to flip back to the end-notes, which do give an incredible amount of context to historical customs, Irish language, Dublin place names, and the like.